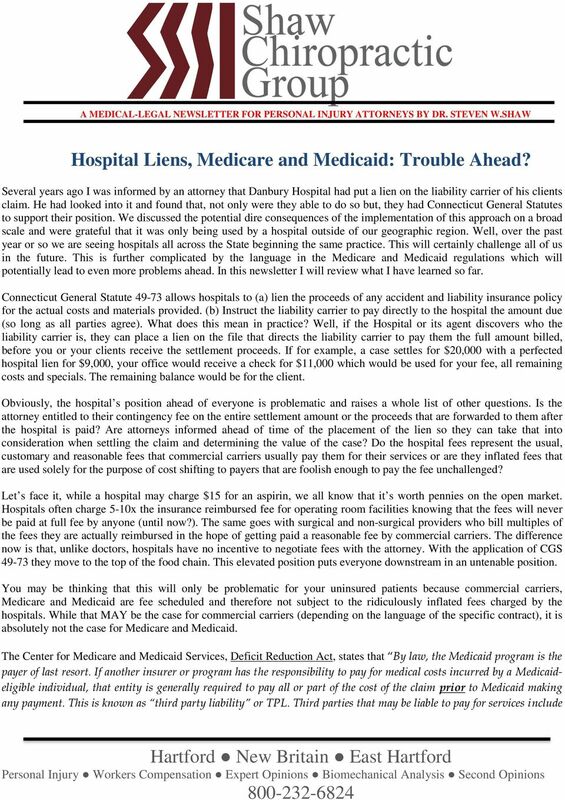 Download "Hospital Liens, Medicare and Medicaid: Trouble Ahead?" 3 Deficit Reduction Act Important Facts for State Policymakers December 11, 2007 Third Party Liability in the Medicaid Program The Deficit Reduction Act of 2005 (DRA) made a number of changes intended to strengthen States ability to identify and collect mistaken Medicaid payments from liable third party payers. The Centers for Medicare & Medicaid Services (CMS) has issued guidance to States on these changes. (A link to this guidance can be found below.) Background By law, the Medicaid program is the payer of last resort. If another insurer or program has the responsibility to pay for medical costs incurred by a Medicaid-eligible individual, that entity is generally required to pay all or part of the cost of the claim prior to Medicaid making any payment. This is known as third party liability or TPL. 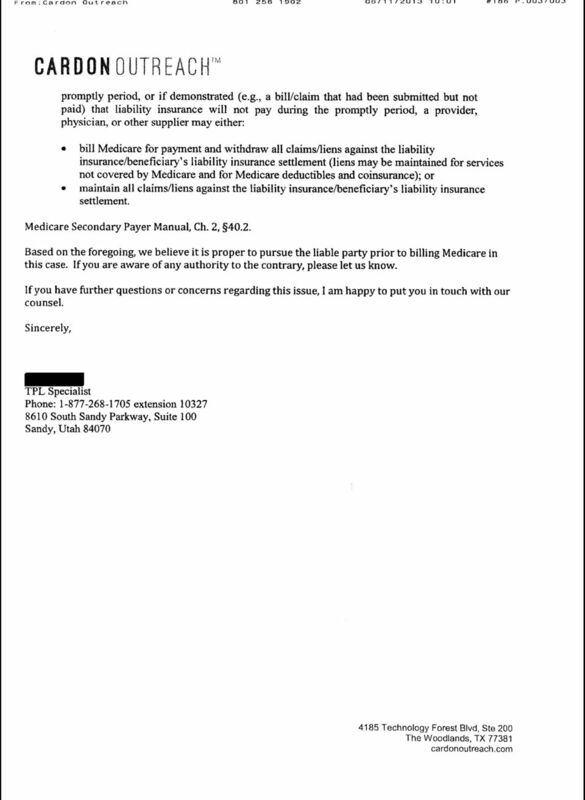 Third parties that may be liable to pay for services include private health insurance, Medicare, employer-sponsored health insurance, settlements from a liability insurer, workers' compensation, long-term care insurance, and other State and Federal programs (unless specifically excluded by Federal statute). Third party payers are not responsible for reimbursing Medicaid for any services that are not covered under the Medicaid State plan. 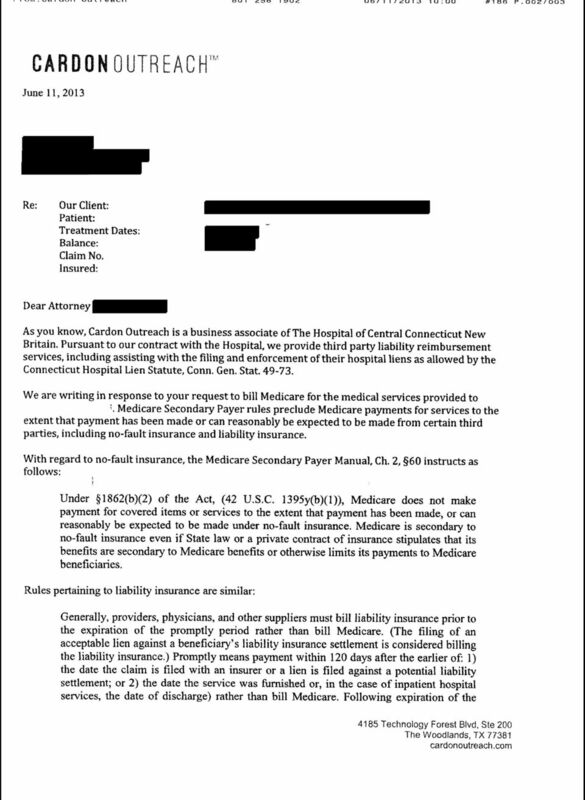 In general, if a State has determined that a potentially liable third party exists, it must attempt to ensure that the provider bills the third party first before sending the claim to Medicaid. This is known as cost avoidance. Whenever a State has paid claims and subsequently discovers the existence of a liable third party it must attempt to recover the money from the liable third party. This is known as pay and chase. States are required to cost-avoid claims, with a few specific exceptions which are identified in regulation. (For more information on TPL, a link to the CMS webpage can be found below.) 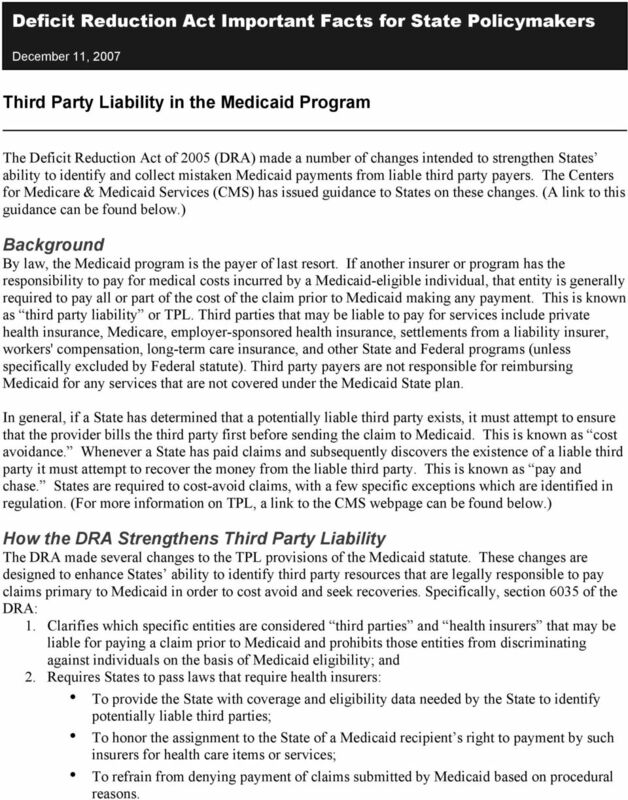 How the DRA Strengthens Third Party Liability The DRA made several changes to the TPL provisions of the Medicaid statute. These changes are designed to enhance States ability to identify third party resources that are legally responsible to pay claims primary to Medicaid in order to cost avoid and seek recoveries. Specifically, section 6035 of the DRA: 1. 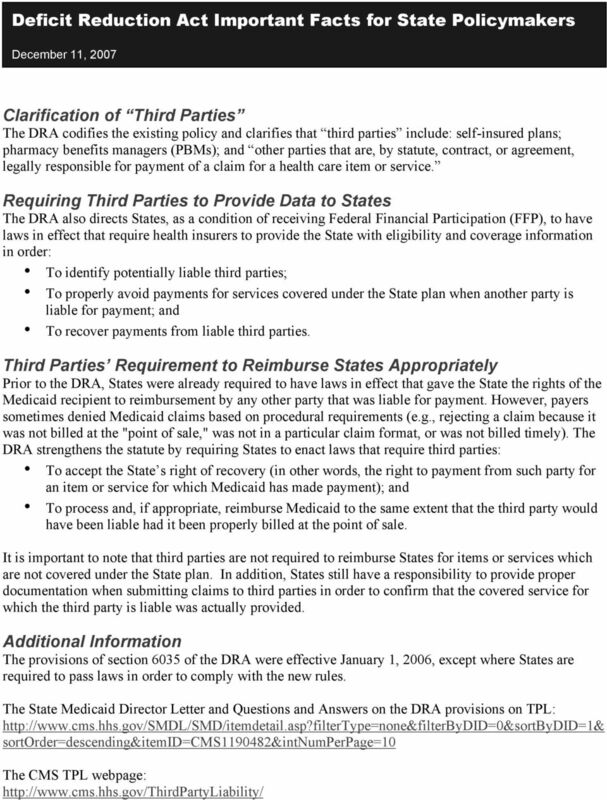 Clarifies which specific entities are considered third parties and health insurers that may be liable for paying a claim prior to Medicaid and prohibits those entities from discriminating against individuals on the basis of Medicaid eligibility; and 2. 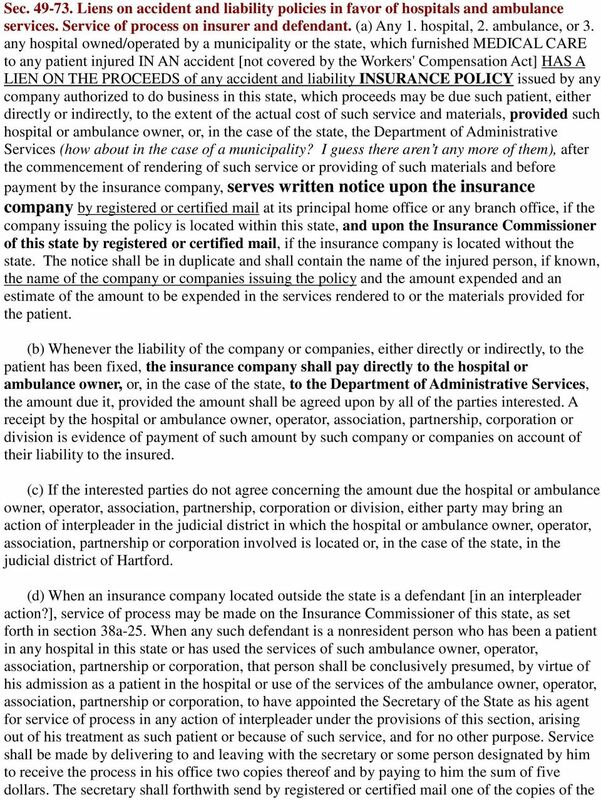 Requires States to pass laws that require health insurers: To provide the State with coverage and eligibility data needed by the State to identify potentially liable third parties; To honor the assignment to the State of a Medicaid recipient s right to payment by such insurers for health care items or services; To refrain from denying payment of claims submitted by Medicaid based on procedural reasons. 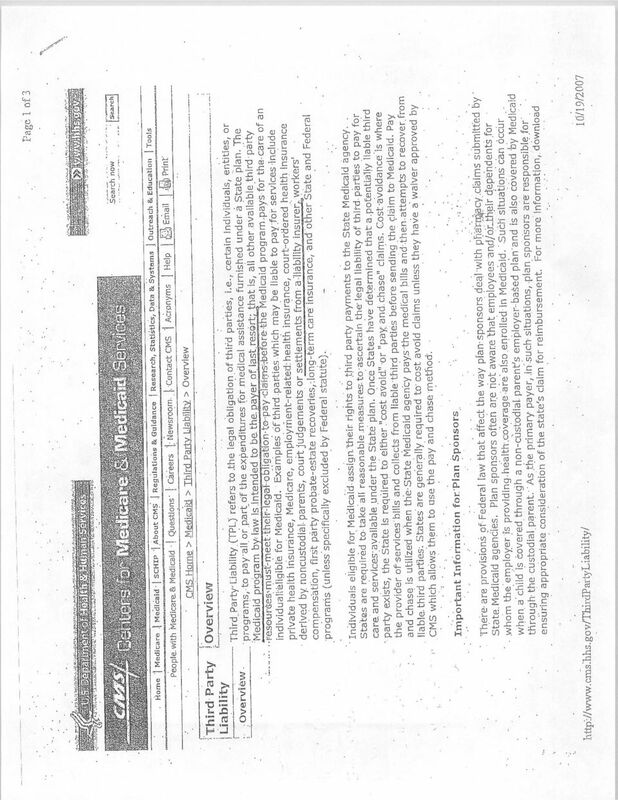 6 process to the defendant at his last-known address and shall keep a record of all process so served on him. J. Richard Lilly, M.D., A.B.F.P., & Associates, P.C. Why Learn About No-Fault? 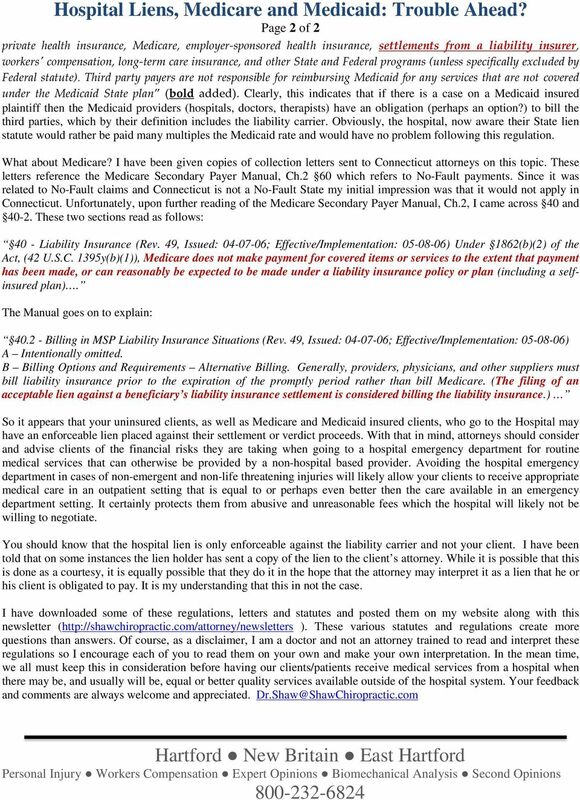 Michigan No-Fault Law: What You Don t Know Can Hurt You Third Party Payer Day Mt. Pleasant, Michigan October 30, 2015 Robert E. Dice, Jr., Esq. Dice Law PLLC 25925 Telegraph Rd. ADDRESSING MEDICAL LIENS IN AUTO ACCIDENT LITIGATION. Jonathan R. Granade. Casey Gilson P.C.